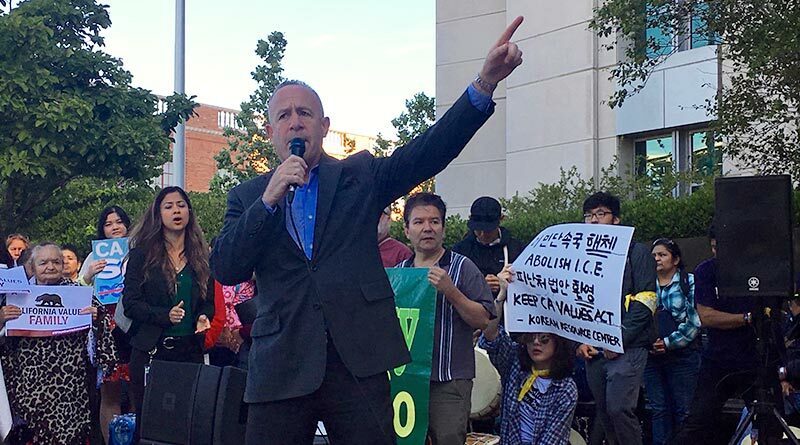 Sacramento Mayor Darrell Steinberg spoke in support of undocumented parents and against the separation of families. Members of Sacramento’s labor community joined with immigration activists in June to protest the separation of families at the border. More than 200 protesters met in front of the federal courthouse in downtown Sacramento last month during a hearing regarding California v. U.S.A.
That case is the federal government’s attempt to overturn California’s sanctuary laws, which protect workers’ rights and prevent local law enforcement agencies from acting as federal immigration agents. Activists spoke out against the May “zero tolerance” policy announced by President Trump that resulted in more than 2,000 children being taken away from their parents at the border and placed in shelters and foster care across the country – including some in the Sacramento region, according to media reports. State senator Kevin de Leon, who helped write California’s sanctuary laws, and Sacramento Mayor Darrell Steinberg both spoke at the event. Faced with intense pressure from activists like those who gathered at the courthouse, Trump was forced to walk back his separation policy in June. Instead, the administration is contemplating building mass family detention camps, including some in California – which activists are protesting as indefinite detention of families similar to the interment of Japanese Americans during WWII. The government in late June announced plans to reunify the children with their families, but how that will be done is still uncertain. Many children speak no English and have had no contact with parents since being separated, media has reported. 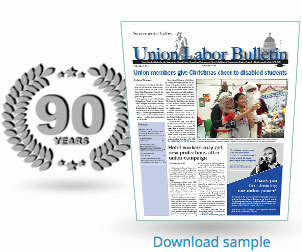 Unions including AFT, AFSCME and SEIU in June wrote a letter to Trump lambasting the policies and their outcomes. “To be clear, those families seeking protection in the United States are not exploiting loopholes in U.S. law. The right to seek asylum here is enshrined in domestic and international law, and does not guarantee any one family protection. Indeed, it has been extensively documented that those seeking protection face enormous obstacles to making a claim or doing so, especially from immigration detention. These challenges are unspeakably exacerbated when combined with the trauma of separation from one’s parent or one’s child. Family separation also comes at an enormous cost to the U.S. taxpayer, who foots the bill for the separate detention of parents and children, the cost of criminal prosecution, and the costs of what are now two or more separate immigration court cases rather than a single case for one family,” the letter reads. We are appalled that these policies are being implemented at the same time that ICE is indiscriminately targeting undocumented immigrants and doubling down on home and workplace raids. Immigrant parents and caregivers who have lived in U.S. for decades are being forcibly taken away, leaving a trail of countless American children without their mothers and fathers. Together with your administration’s decision to strip over a million people of either Temporary Protected Status or DACA, these actions are forcing countless parents to leave behind their families, their businesses, their communities, and the country they proudly call home.